To kick off the charette a panel discussion about Urban Agriculture moderated by UW landscape architecture professor of history, Thaisa Way and including Jason King, Principal of TERRA.fluxus in Portland and author of popular blog Landscape + Urbanism , Jeff Hou, the chair of the UW landscape architecture department Keith McPeters, a principal at Gustafson Guthrie Nichols in Seattle, and myself, Deb Guenther principal at Mithun. 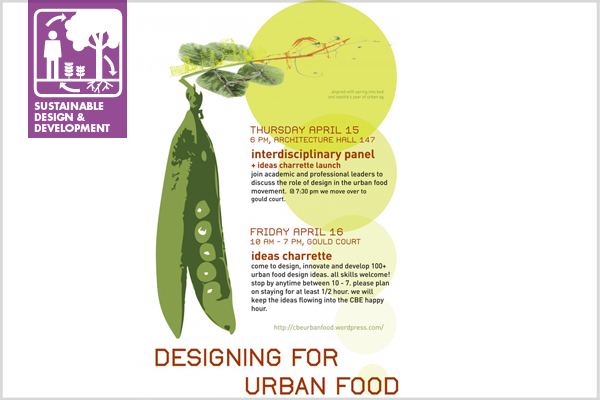 The panel was preceded by a summary of outstanding interdisciplinary student work in a studio integrating urban farming with the Yesler Terrace – an affordable housing redevelopment by the Seattle Housing Authority. Jason’s presentation revealed Portland’s long-time commitment to urban farming along with a series of five principles: 1. Utilize a hierarchy of urban spaces, 2. Work through policy barriers, 3. Reframe permaculture in a new lens, 4. Maximize Efficiency per square foot, and 5. Develop orderly frames. I found his comprehensive list of the wide range of urban farming typologies to be immensely interesting as it captured the wide range of ways we are beginning to integrate a “new” , old land use into our cities. I shared a range of urban agriculture work that Mithun is involved in to illustrate, as Jason’s big list did, that the goals of each project will dictate the typology and generate new typologies – some examples were hybrid parks that include community gardens and leased p-patches; a farmer’s market; market gardens providing supplemental income to low-income families; floodplain conversion to city farming; transit-oriented development that might include vertical farming uses; and folks at Mithun that are personally involved in a multi-partner program that support a new generation of farmers and a program called LettuceLink, using vacant lots for farming that serves a neighborhood scale. Our role as city designers takes us beyond the design of food production environments to include issues of delivery, consumption and waste. Keith McPeters summed up the passion of the evening building behind the multiple benefits and potential of urban agriculture by roughly quoting JB Jackson’s criteria for whether design is good – is it ecologically wholesome, socially just and spiritually rewarding? Clearly, the enthusiasm for these aspects of urban agriculture’s impact on our culture and cities is high. I believe the challenge is to ask ourselves the hard questions about economic value, about highest and best land use and about management models so that we can be prepared to address them as urban agriculture evolves. The group was treated to reception of local food and wine and the beginning of the charrette was launched which carried on through the next day – engaging students, professionals and community members to continue to explore these issues. Excellent news. Seattle’s climate and landscape are ideal for so many varieties of food crops, and yet it remains a relatively untapped source of urban agricultural development. Can’t wait to visit in June and see what they’ve come up with. How much food is now grown in Seattle after 5 years? My son grows raspberries there in his backyard.